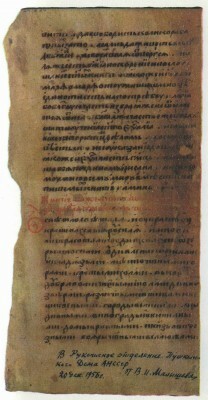 The names mentioned in the Lay and the context in which they are found (“up to the Yaroslav of our day and his brother Yuri, Prince of Vladimir”), the echoes of the legends about Vladimir Monomachos and certain South-Russian features in the work give grounds for assuming that The Lay of the Ruin was written by an author of South-Russian origin in North-Eastern Russia not later than 1246 (the Yaroslav “of our day” is Yaroslav, son of Vsevolod, and he died on September 30, 1246). 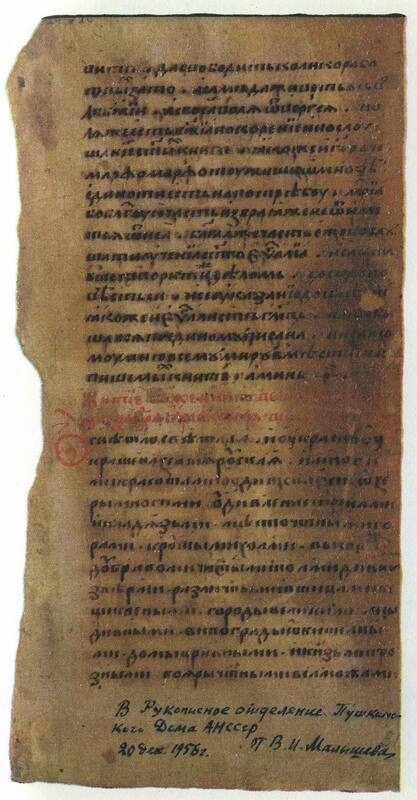 The title of the work (which is found in one manuscript) and the phrase on which the text breaks off (“And in those days … a disaster befell Christian folk”) give grounds for regarding this work as a response by an unknown author to the Mongol invasion. Most likely The Lay of the Ruin was written between 1238 and 1246. The author of the Lay extols the beauty and splendour of the Russian land: “Oh, fairest of fair and finely adorned Russian land! You are renowned for many beauties: you are famed for your many lakes, rivers and sacred springs, your mountains and steep hills … your wondrous and diverse birds and beasts…” The Russian land is adorned not only with the beauties and gifts of nature, it is also famed for its “mighty princes, honest boyars, and many nobles”. Developing the theme of the “dread princes” who have conquered “pagan countries”, the author of the Lay portrays the ideal Russian prince, Vladimir Monomachos, before whom all neighbouring peoples and tribes trembled. Even the Byzantine Emperor Manuel sent Vladimir gifts so that “he would not take Constantinople away from him”. This hyperbolised picture of the “dread” grand prince embodied the idea of strong princely authority and military prowess. At the time of the Mongol invasion and the military defeat of the Russian land a reference to the strength and might of Monomachos served as a reproach to the Russian princes of the day and was also intended to inspire hope for a better future. It is, therefore, no accident that the Lay was inserted at the beginning of The Tale of the Life of Alexander Nevsky; here Alexander, a contemporary of Batu’s, appears as a dread prince. The Lay of Igor’s Host was a lyrical call for the unity of the Russian princes and Russian principalities on the eve of the Mongol invasion. The Lay of the Ruin of the Russian Land is a lyrical response to this invasion.